From the start of the struggle for independence, Simón Bolívar |1|, like other independentist leaders, launched a policy of internal indebtedness (which ended up benefiting the local ruling class) and external indebtedness toward Britain and its bankers. In order to borrow abroad, he engaged part of the nation’s wealth as collateral and agreed to free-trade agreements with Britain. The bulk of the sums borrowed never reached Latin America because the bankers in London skimmed off enormous commissions, charged actual interest rates that were abusive, and sold the securities for well below their face value. Certain Latin American representatives appointed by the independentist leaders also withheld large commissions at the source, or else simply stole part of the amounts borrowed. As for the rest, another large share of the borrowed amounts was used directly to purchase weapons and military equipment from British merchants at exorbitant prices. Out of what eventually made it to Latin America – that is, only a small percentage of the loan amounts –, large sums were misappropriated by certain of the new authorities, military leaders and the local dominant classes. A series of quotations from Simón Bolívar accompanied by commentary by Luis Britto clearly show that the Libertador gradually became aware of the debt trap into which he and the new independent States had fallen. Simón Bolívar did not seek to enrich himself personally by taking advantage of his functions as head of State, unlike many leaders who came to power thanks to struggles for independence. The representative and the lenders may make use of it with the greatest freedom.” (Britto p. 395). Initially, the debts contracted were exclusively to serve the war effort. Rosa Luxemburg, nearly a century later, considered that these loans, while necessary, had served as an instrument of subordination of the young States being created: “Though foreign loans are indispensable for the emancipation of the rising capitalist states, they are yet the surest ties by which the old capitalist states maintain their influence, exercise financial control and exert pressure on the customs, foreign and commercial policy of the young capitalist states.” |3| I have analyzed the link between the policy of indebtedness and free trade agreements in the first half of the 19th century in Latin America in “How Debt and Free Trade Subordinated Independent Latin America,”. The British Consul, Sir Robert Ker Porter, mentions conversations with Simón Bolívar in his journal, and in the entry for Wednesday 15 February, 1827, observes that “Bolívar confesses to an internal debt of 71 millions of dollars, in paper, to be paid by the Govt. Hundreds of individuals have speculated deeply, and most usuriously in the paper…” According to the Consul, the paper was sold for US dollars by persons in urgent need at 60% of its value, and in certain cases 25% and even 5% of its face value. He goes on to explain that according to his sources almost no officials had kept any cash, spending it all in this “immoral and antipatriotic speculation.” He says that Vice-President Santander is said to possess two million in these bonds, which he is said to have purchased for $200,000 (see Britto, op. cit. p. 378). Luis Britto adds the following comment: “These speculators are in turn closely related to numerous officers and republican politicians, who are making large fortunes at the expense of the blood of their troops” (p. 380). And he adds: “The mere announcement of rigorous tax measures strikes fear into the hearts of civil servants like the Intendant Cristóbal Mendoza, who suddenly tendered his resignation.” (p. 380). “The national debt engenders a chaos of horrors, calamities and crimes and Monsieur Zea is the spirit of evil, and Méndez the spirit of error, and Colombia is a victim whose entrails these vultures are tearing to shreds: they have already devoured the sweat of the Colombian people; they have destroyed our moral credit, and in exchange we have received meagre support. Regardless of the decision taken regarding this debt, it will be horrible: if we recognise it, we cease to exist, and if we do not… this nation will be the object of opprobrium.” (Britto, p. 405). We see clearly that Simón Bolívar, who had become aware of the debt trap, rejects the prospect of repudiation. Simón Bolívar, pushed to the wall by the creditors, was prepared to cede public commodities to them. In 1825, he offered to repay the debt by transferring a part of Peru’s mines, which had been abandoned during the war of independence (see Britto p. 408 and following); in 1827, he attempted to develop a quality tobacco crop to sell to Britain to pay the debt (Britto, p. 378-382); in 1830 he offered to sell unused public land to the creditors (Britto, p. 415-416). “The masters of the mines, the masters of the Andes of silver and gold, are seeking loans of millions in order to poorly pay their little army and their miserable administration. Let all this be told to the people, and let our abuses and our ineptness be forcefully denounced, so that it may not be said that government protects the abominable system that is ruining us. I repeat, let our abuses be denounced in the “Government Gazette”; and let pictures be painted there that offend the imagination of the citizens.” (Britto, p. 408). In December 1830, Simón Bolívar died in Santa Marta (on the Caribbean coast of Colombia), at a time when Gran Colombia was in strife and abandoned by the ruling classes of the region. Thanks to Lucile Daumas for her French translations of quotations in Spanish, which served as basis for the English translations (by CADTM). |1| Simón Bolívar, who was born 24 July, 1783 in Caracas, Venezuela and died on 17 December 1830 at Santa Marta, Colombia was a Venezuelan general and politician. He is an emblematic figure, with the Argentine José de San Martín and the Chilean Bernardo O’Higgins, of the emancipation of the Spanish colonies in South America from 1813. He participated decisively in the independence of present-day Bolivia, Colombia, Ecuador, Panama, Peru and Venezuela. Bolívar also played a part in the founding of Gran Colombia, which he wished to see become a great political and military confederation including all of Latin America, and of which he was the first President. 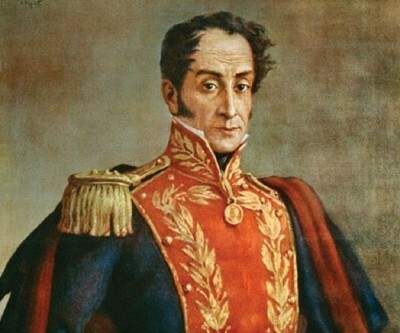 The honorary title of Libertador was given him initially by the Cabildo of Mérida (Venezuela), then ratified in Caracas (1813), and is still associated with him today. Bolívar encountered so many obstacles in bringing his projects to fruition that he referred to himself as “ the man of difficulties” in a letter to Francisco de Paula Santander in 1825. As a major figure of universal history, Bolívar is today a political and military icon in many countries in Latin America and around the world, who have given his name to many squares, streets and parks. His name is also borne by a State of Venezuela, a department in Colombia, and even a country – Bolivia. Statues of him are found in most large cities in Latin America, but also in New York, New Orleans, Lisbon, Paris, London, Brussels, Cairo, Tokyo, Québec, Ottawa, Algiers, Madrid, Tehran, Barcelona, Moscow and Bucharest. Eric Toussaint is a historian and political scientist who completed his Ph.D. at the universities of Paris VIII and Liège, is the spokesperson of the CADTM International, and sits on the Scientific Council of ATTAC France. He is the author of Bankocracy (2015); The Life and Crimes of an Exemplary Man (2014); Glance in the Rear View Mirror. Neoliberal Ideology From its Origins to the Present, Haymarket books, Chicago, 2012 (see here), etc. See his bibliography: https://en.wikipedia.org/wiki/%C3%89ric_Toussaint He co-authored World debt figures 2015 with Pierre Gottiniaux, Daniel Munevar and Antonio Sanabria (2015); and with Damien Millet Debt, the IMF, and the World Bank: Sixty Questions, Sixty Answers, Monthly Review Books, New York, 2010. Since the 4th April 2015 he is the scientific coordinator of the Greek Truth Commission on Public Debt.